Memories are built on the little touches that make your wedding or other special event truly unique. So why not choose a favor like this one that brings one of a kind appeal to a whole new level? Each Personalized Expression Collection damask design silver metal bookmark favor from Fashioncraft, measures 2” round x 6” long, including tassel, and has a lovely damask cutout patterned rim and an attached white tassel. 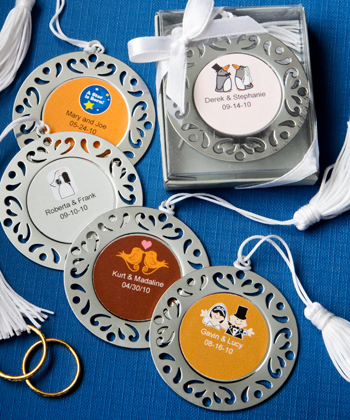 The bookmark’s center is just right for easy application of the personalized label of your choice. From assorted color combinations, to seasonal and themed designs, to your own title, you design the eye catching label that suits your style! Each comes in a clear topped box with a silver base, wrapped with a white satin ribbon, along with self sticking label sheets for you to apply. Please allow 3-4 days for production. Due to personalization, you must order at least 36 favors.